There’s a reason why expert entrepreneurs and bloggers will tell you that building an email list is one of the best things you can do for your business: it’s an effective way to grow your income and brand. That’s because email gives you direct access to your audience. And it converts way better than social media does. But making the most of your list and the emails you send to your subscribers is easier said than done. After all, even once you have more than just your mom and your neighbour on your list, you still have to get your subscribers to open your emails and convert. And if you’ve ever checked your email campaign analytics and seen a dismally low click-through rate, you know exactly what I’m talking about. 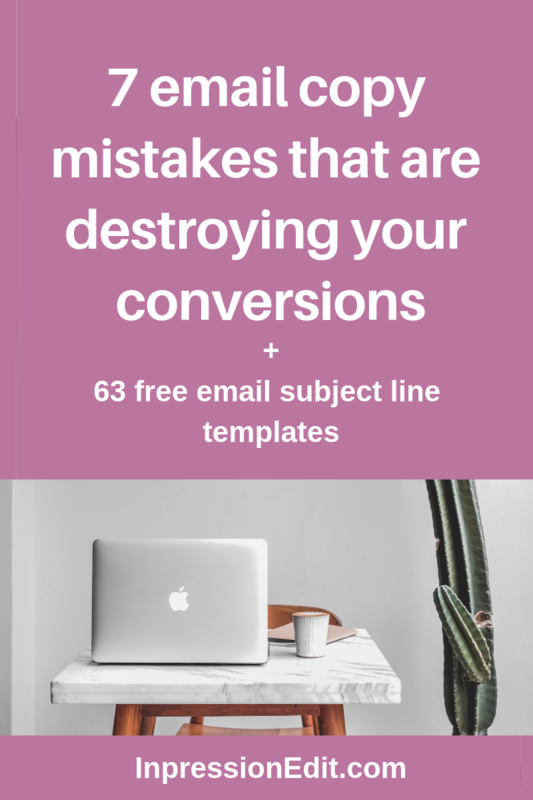 What’s holding you back from getting the conversions you’ve been working so hard to get? 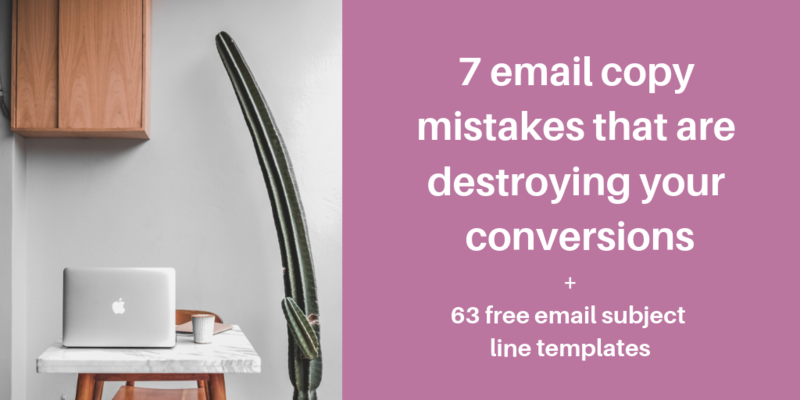 You could be making one of these 7 critical email copy mistakes. Keep reading below to find out what they are and how to fix them. Need help crafting email subject lines that will make subscribers actually open your emails? Download my 63 free email subject line templates. Crafting a Buzzfeed-style subject line for your email (like “Your boss is watching you right now”) may boost your open rate. But if your subscribers read the body of your email and discover that it doesn’t live up to the hype of your subject line, they are not going to be happy campers. Trust me on this one. It’s totally okay (and even strategic) to experiment with blind subject lines. These are subject lines that play on curiosity by being intentionally vague and intriguing. I used one of these in an email to promote my blog post on how to write compelling social media posts. But if you consistently use email subject lines that are dramatic and sensational, your audience will start to tune you out. They may even begin to distrust you if they feel that your subject lines overpromise and underdeliver. So how do you avoid this email copy mistake? Steer clear of writing subject lines that look and smell like click bait. Instead, stick to writing headlines that are engaging and accurately reflect the content of your email. 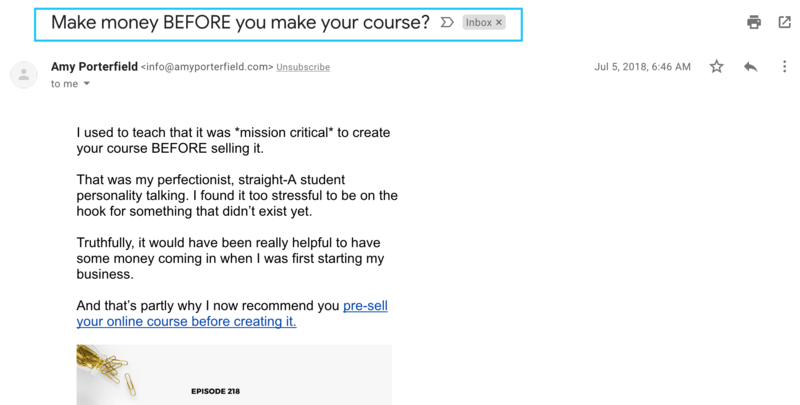 Example: Amy Porterfield’s email subject line accurately reflects the content of the email but also taps into her subscribers’ curiosity by addressing a key question they have. The luxury of having an email list is that you get a direct line of communication to your subscribers. As a result, you have a golden opportunity to truly connect with your subscribers and build a relationship with them. What’s the best way to mess this up? By writing emails that consistently focus on you and your brand. You know, the ones where you’re constantly sharing info about upcoming products or projects, team bios, or the industry award you won last week. Now, I’m not saying that you can’t share any info about yourself or your brand in your emails. In fact, you want to share a piece of your story to some degree so that your audience can feel connected to you. But avoid writing email copy that keeps the spotlight on you instead of on what your subscribers need and want. Remember, your subscribers are on your list because they think you can make their lives better in some way. So use your emails to focus on the problems they’re trying to solve and the value you can offer them. 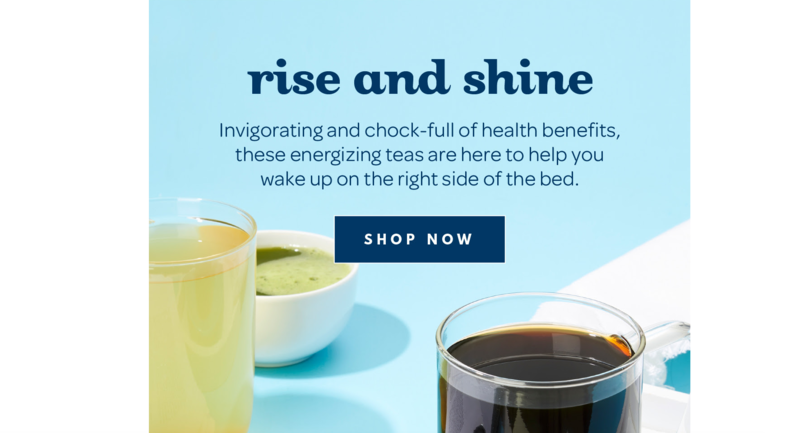 Example: This email from DavidsTea sells a product by focusing on the benefits it offers to customers. I don’t need to tell you that your subscribers get TONS of emails in their inbox (even though I just did). But it’s important to keep this fact front and centre in your mind when you’re crafting your email copy. Because if you don’t, it’s easy to get lazy and think that a mediocre email with bland copy will be enough to convince your subscribers to check out your blog post or register for your webinar. Newsflash: it won’t be. If your email copy sounds like it was written by a robot, inject some personality into it to make it more engaging. You can do this by adding humour, telling a story, or even making self-deprecating remarks (sparingly) if that’s your thing. Think about your brand personality and let it shine through in your email copy. 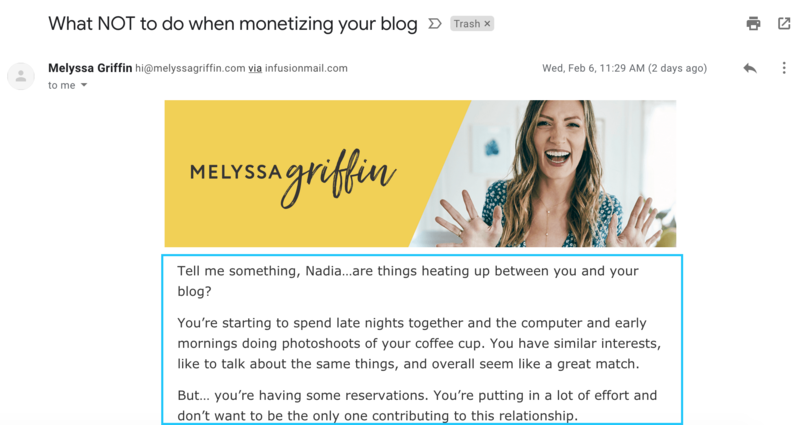 Example: Melyssa Griffin uses a fun relationship metaphor to make this email about monetizing a blog engaging. Your vegan baking audience may love that you send them a bullet list of vegan baking tips in the body of an email every week. But if you’re not using your email copy to convert your subscribers in some way, you’re leaving something on the table. Now, I’m not saying that you need to be pitching a product or service in every email you send. In fact, you definitely shouldn’t do this because it’s one of the easiest ways to alienate your subscribers. But make sure each and every email you send encourages your subscribers to take some sort of action. This can be as simple as directing people to the full blog post that you tease in your email. 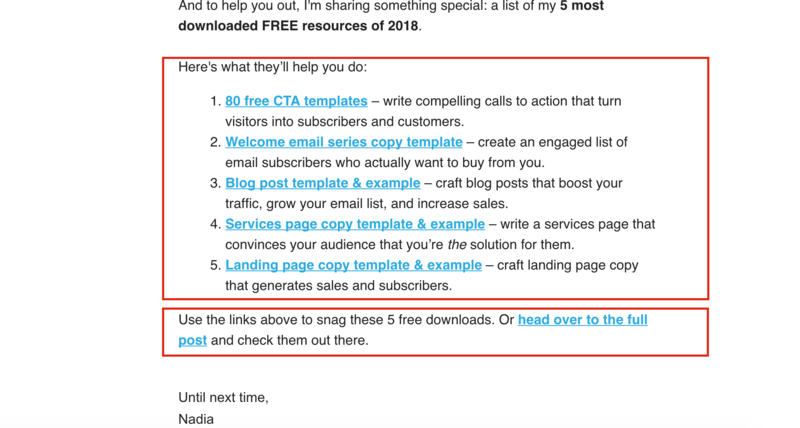 Tell your subscribers exactly what you want them to do when they finish reading your email by including a clear call to action (CTA) in your email copy. And don’t forget to repeat it a few times throughout your copy to maximize conversions. 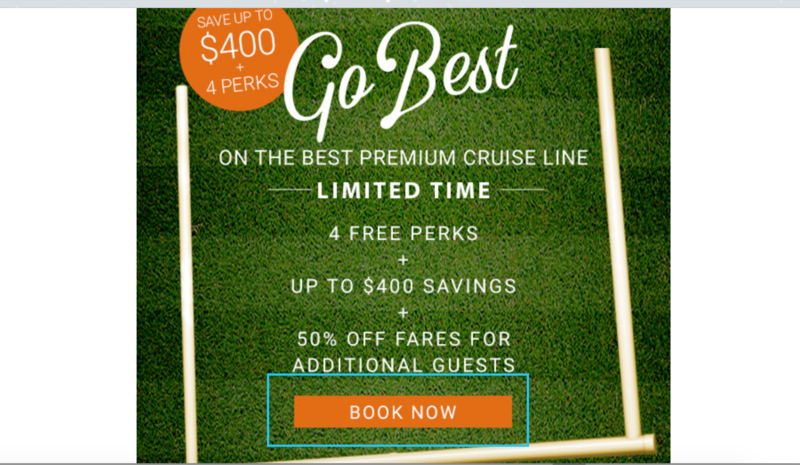 Example: Celebrity Cruises presents a single CTA in this email to focus subscribers on a single next step and eliminate distractions. When you craft them carefully, CTAs can be incredibly powerful. But here’s the thing: they perform best when you let them fly solo. That’s why you want to resist the temptation to include more than one type of CTA in each email you craft. Having multiple CTAs in your email copy can make your email seem unfocused. And it can make your subscribers confused about what you want them to do next. How do you avoid this email copy mistake? Identify a single overall goal for each email you craft BEFORE you start writing. For example, are you writing an email to tease a blog post, direct subscribers to your new YouTube video, or pitch a paid product? Once you know what your goal is, write email copy that stays laser focused on achieving this particular goal. This includes writing CTAs that encouarge your subscribers to take one and only one action. Note that in some cases, it may be appropriate to include multiple CTAs in an email. For example, in my email on my top 5 downloadable resources of 2018, I included direct links to each of the 5 resources right in the email. However, you’ll see that my main CTA at the end of the post still focuses on one and only one action. There isn’t necessarily anything wrong with writing a long email. In fact, you’ll find that when expert entrepreneurs and bloggers send you an email sequence to pitch something to you, their emails tend to be more than a few paragraphs long. But remember, there’s a difference between long email copy that provides value in every sentence and email copy that simply rambles and wastes your subscribers’ time. To keep your subscribers from peacing out when they read your email, make your copy only as long as it needs to be. If you can say what you need to say in 200 words instead of 400, don’t take up that extra space (no matter how tempted you feel to do so). 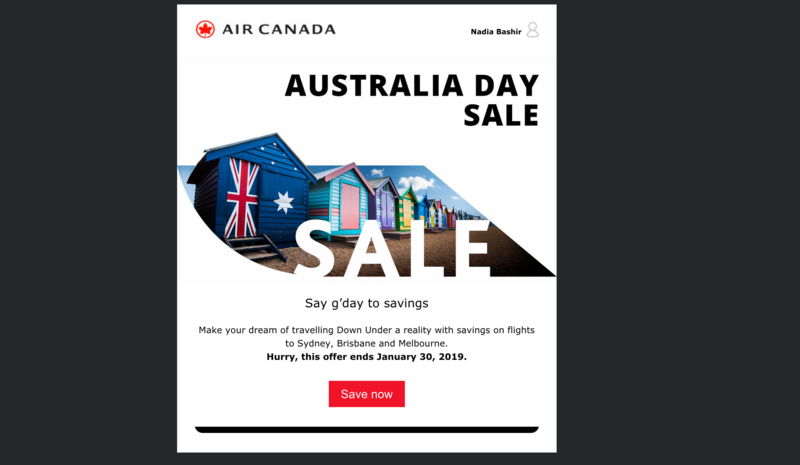 Example: Air Canada decided to keep this email about its Australia Day sale short and sweet. Unless your subscribers already know you very, very well, they’ll be sizing you up each time they read your emails. And what’s one of the things they’ll definitely notice? Typos and grammar errors. After all, would you be willing to shell out money to someone who asks you to “Byu now” in their email? To keep your subscribers from thinking that you’re sketchy, make sure to proofread your emails before you send them. Any if grammar and writing aren’t your strengths, be sure to have someone else review your email copy too. If your subscribers aren’t clicking through on your marketing emails, it doesn’t mean that they’re not interested in your products, services, or brand. Instead, there may be something in your email copy that’s turning them off or holding them back. Avoid some of the most common email copy mistakes that brands make by crafting authentic subject lines, engaging body copy, and effective CTAs. 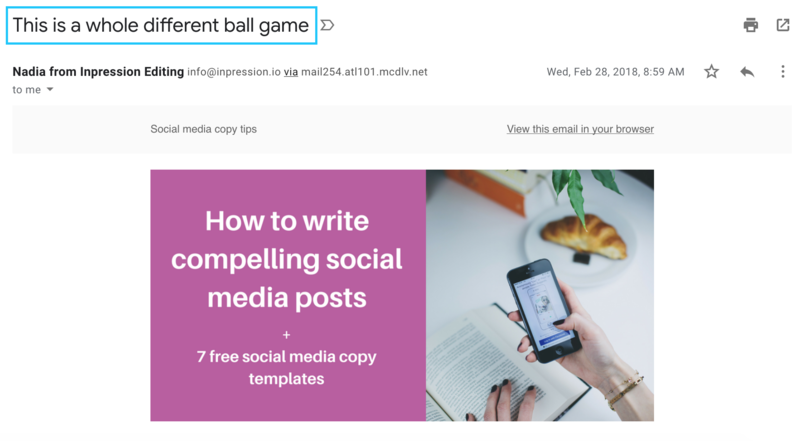 You’ll be surprised by how a few simple tweaks to your emails can go a long way toward giving you the results you’ve been looking for.